1. 50% Bovada Review 4.50 Bet now ! 2. 25% BetOnline Review 4.30 Bet now ! 3. 50% TopBET Review 4.20 Bet now ! 4. 25% Sportsbook.com Review 4.20 Bet now ! 5. 100% WagerWeb Review 4.20 Bet now ! 6. 50% 5Dimes Review 4.10 Bet now ! 7. 25% SportsBetting Review 4.00 Bet now ! 8. 15% Bookmaker Review 4.00 Bet now ! Welcome to Sports Gambling Review, the home of unbiased online sportsbook reviews and sportsbook ratings for sports betting enthusiasts. Compare over 500 online sportsbooks reviews including our list of the best sportsbook bonuses. Find the best US Sportsbooks and UK / Euro Bookmakers and avoid getting scammed by rogue online sports betting sites. Sports Gambling Review's team of experienced staff have compiled the most researched sportsbook information available online today. Don't gamble when it comes to selecting an online sportsbook or online bookmaker. Consult SGR's list of recommended sportsbooks and bookmakers. Visit SGR regularly for updated online sportsbook ratings, online sports book reviews and info on rogue sportsbooks. For any problems with internet sportsbooks rated 3+ stars, please contact us now. 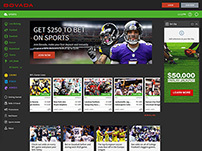 Looking for a sports betting site to play with, but not sure which one to make your home? Take a look at the sportsbooks and reviews provided on our site, and make an educated decision. There are many options to choose from out there, and many sportsbooks present solid value and unique selling points. But the key is to find a site that best suits your unique needs as a bettor. The best sportsbook bonuses are available to right here on this site. Our long standing relationships with the biggest brands in sports betting allow us to offer you bigger bonuses! As well as verifying for quality and trustworthiness, players looking to open a new account with a sportsbook generally make their selection based on the best sports betting bonuses they can find. The offers vary a great deal from book to book, so it�? ?s good to review them with a keen eye before picking your sportsbook. 50% Freebet on your 1st Deposit, up to $250! 50% Sign Up Bonus, up to $250 on your 1st Deposit! Exclusive promotions for members including reduced juice Fridays, parlay refunds, reload bonuses and much more !